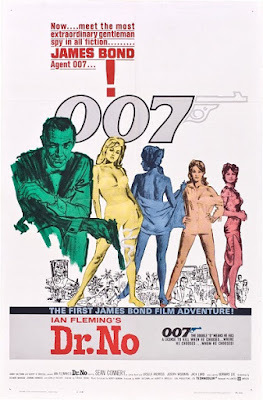 Corinne and Tim face their toughest mission yet as they come up against Dr. No, the original James Bond film from 1962. We'll discuss the film's blatant sexism and racism, its role in establishing the formula for the rest of the Bond film series, and how the exploits of Bond reflect England's role in international affairs in the 1960s. Warning: Contains spoilers, explicit language, and bad Sean Connery impersonations. Also please be advised that in discussing the movie we do reference a sexual assault brought up as a plot point in the film. Have a unique vodka-martini recipe? Do you have a good reason for toppling NASA rockets? Want to place a bet as to how long before Corinne joins SPECTRE and plots her revenge against Bond? Leave a comment and keep the discussion going. Having watched through the entire James Bond series a couple years ago, you're both spot on about it being quite the collection of awful for the most part. For all the amazing action, colorful characters, and scenic locales, it's a trainwreck when it comes to disturbing views, poor writing, and macho power fantasies. To the point where it actually becomes kind of fascinating as it becomes this reactionary window viewing eras of pop culture through the eyes of stuffy white dudes who don't really get any of it, but not so much that I'd recommend the journey to most. Craig era aside, there's only 3, mayyyyybe 4 Bond films I think are genuinely good and am happy to revisit on a regular basis. Not the best of track records. Great episode. As bleak as the franchise can be, Dr. No is definitely on the lower end of it because it's a rather slapped together B-production, lacking the camp and spectacle which would later be hallmarks, and I've never been fond of Connery's Bond because of the brutal, creeper way he plays the role. Which takes on an even nastier note given Connery's personal views on women. Yeah, I'm already dreading how Corinne is going to react to Live and Let Die once we get there... if we get there. Even From Russia With Love, which I've generally considered to be one of the best (mostly for Robert Shaw), has some stuff that makes me cringe. We're bound to run into trouble with the Romani camp fight. Dr. No does feel like the origin movie for a superhero series, where setting up the hero and the formula for the sequels takes precedence over a well-constructed story. As for Connery, I'm torn because while he's a creep both on and off-screen, he does have charisma as an actor and I find him more watchable than Moore, who often comes across as a snobbier form of creep. If only we could have had Dalton in more (and better) films. Yeah, even the best in the series - for me, From Russia, Majesty's Secret Service, Goldeneye - have their unfortunate elements. Even the Craigs don't escape it.